The IT Services Fall 2018 Department Meeting recently convened in DSC, Ledbetter ‘A’. Thomas Bunton, Chief Information Officer and Associate Vice Chancellor, introduced new staff members Brad McMillian, Andrew Lee, Stephen Roberson, and Erica Roy. Next, he outlined the various topics to be covered in the meeting including: 2018 Successes, Campus Focus, ITS Structure, Facilities, Organizational Updates, ITS Focus/Accountability/Goals, and Events. Before launching into the agenda items, a fun and fast-paced icebreaker game using a smart phone app was begun. All attendees competed against each other by answering a number of timed, tricky, and trivial multiple choice questions related to the IT world. The results were displayed in real-time on a screen so all could see who was leading with the most correct answers. 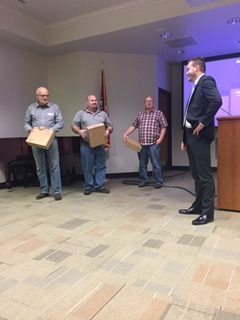 The winners were Don O’Donnell (1st place), Jason Rogers, (2nd place), and John Franks (3rd place). The grand prizes were Lego Kits (which may have been left over from the last Fall Department Meeting). Bunton thanked the staff for all of their hard work and reiterated some of the department’s most significant 2018 successes including: Network/WiFi Upgrades, VMWare Upgrades, Banner 9, University Directory, Blackboard Analytics, Alumni Manager, New Servers, ADHE Report, Kaspersky, Newsletter, Electronic Lock, Office 365 VDI, Data Warehouse, Campus Living, WordPress, Fast Lane, Orientations, Training, CRM, Firewalls, College Scheduler, Parchment, SCCM, and Student Lab. In closing, Bunton referenced the top 5 strategic goals of the university and encouraged everyone in IT Services to read, understand, and review them throughout the upcoming year.